This election on Tuesday, November 4, 2008, is slated to make history because Americans may be electing their first African-American president, if Barack Obama continues to hold the lead in this race. 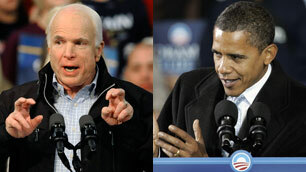 Many people are expecting Obama to win this election, unless McCain pulls a last minute win. So far, one day before Election Day, Sen. Obama is still in the lead by about 7-10 points over Sen. John McCain, depending on pollsters. I think it is very likely Obama will be the next president of the United States. From what I’ve seen on television news, the line ups for early voting are long. Many people want to make sure they get their votes in, and it shows many people are really excited about this election. This might even be the biggest voter turnout in recent American history. It’s good for the democratic process. So get out there and vote tomorrow. Next Next post: Barack Obama is the new President-elect: Congratulations!